For anyone concerned about disruptive climate change, 2016 was a tumultuous year. On 4 November, the Paris climate change agreement went into force; three days later, Donald Trump, who has called climate change a hoax “created by and for the Chinese in order to make US manufacturing non-competitive” was elected President of the United States. Even before election day, there were troubling signs on the horizon. Scientifically, new data showed that two of the most dangerous impacts of climate change, ice-melt and record high temperatures, were accelerating. Politically, conservatives in Washington, DC were already mobilizing to block the Paris accord, just as they blocked US participation in the Kyoto protocol. Now the President-elect proposes to appoint the CEO of Exxon-Mobil, Rex Tillerson, whose company has committed to developing the world’s largest untapped oil reserves - in the Russian Arctic - to lead the US State Department. But the fact is, a number of oil and gas companies have been gearing up to drill in the Arctic for many years and the Paris Agreement doesn’t change that. In fact, it left each country to decide for itself what to do and how to do it. So while American leadership would be desirable, it is not a prerequisite for the rest of us to proceed. There is an enormous amount that the business community can do, because at root the solution to climate change is technological. Anthropogenic climate change is primarily caused by burning fossil fuels and cutting down forests. Therefore, it will be prevented primarily by switching the sources of our energy and greening our supply chains. Government policies can support and accelerate these transitions, but they are not required. According to Bloomberg, solar power is now the cheapest form of energy in many countries, including in nearly 60 low-income ones. In emerging markets, solar and wind are outcompeting oil, gas and coal, despite very low prices for those commodities. Some of this is driven by government policy, particularly investment by the Chinese government in renewable energy infrastructure, but increasingly renewable energy is both preferable and profitable. Meanwhile, at Unilever, CEO Paul Polman is demonstrating that businesses can support sustainable development while serving both their customers and their shareholders. Unilever has aligned their corporate strategy with the United Nations Millennium Development goals, noting that the scale of the activities of large corporations enables them to have real impact. However, private-sector leadership on climate will require us to overcome some conceptual obstacles. One conceptual obstacle is that “socially responsible” is not fiscally responsible. In diverse sectors, companies around the globe have proved that isn't true. Just look at BMW. According to a recent report in Forbes, BMW was the world’s most sustainable company in 2016, while enjoying low employee turnover, taking a responsible approach to investment, maintaining a low ratio of CEO-to-average worker pay, and, yes, making large profits by making great cars. That said, many socially responsible policies don't address carbon - indeed, BMW lags badly on that point. Addressing climate in terms of both products and policies - including the application of corporate prestige and influence to advance sound climate policy - should be an essential part of any programme of social responsibility. A second is the free-rider problem. For a long time, many argued that it would be ineffective, perhaps even foolish, to act alone on climate: climate change was a global problem that needed a global solution. Going forward, Russia or the US could become drains on the world economy if they continue to promote damaging fossil fuel development, and already some political leaders have suggested that a carbon tax might have to be imposed on US imports. 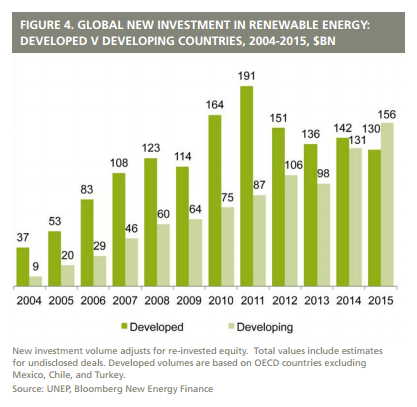 But the fact is: as renewable energy technology becomes increasingly profitable, the companies and countries that lead its development will see their influence and power increase. A third is the idea that efficiency and design are for sissies. Most near-term population growth is likely to be in urban areas, which offers tremendous opportunities not just for energy efficiency but also for creative solutions that support a high quality of life, both at home and in the workplace. The Bullitt Center in Seattle is a case in point: it doesn’t just use less energy, it produces energy. The fourth is the hobgloblin of “energy poverty”. Of course poor people need energy, but that does not mean they need fossil fuels. To the contrary: the work of Social Entrepreneur Harish Hande, Global Shaper Jaideep Bansal, and others like them demonstrates that renewable power can meet the needs of poor communities quickly and efficiently. Just as many rural communities leapfrogged land-lines to adopt mobile telephones, so these communities are leapfrogging 20th Century style land-line electricity into 21st Century distributed solutions. Large, smart integrated grids may be a good choice for the US and Europe, but highly distributed energy may well solve energy poverty, particularly when coupled to the rapid advances in local energy storage that are underway. After all, why make poor people wait for a big expensive grid run on fossil fuels when they can have the energy they need right now? Consider Nokero, which makes solar lights designed to replace costly and dangerous kerosene lanterns. The Indian woman who buys one now doesn’t have to wait for a grid to reach her village. The future is in clean, green energy. 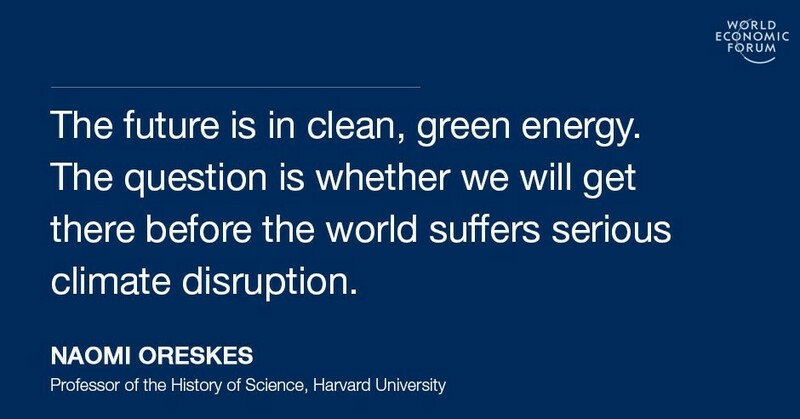 The question is whether we will get there before the world suffers serious climate disruption and what role we as a community will play. We should continue to push for appropriate policy, because history shows that government policy can be a powerful driver of research, development, and innovation, and because appropriate policies will be essential to future cities. We should work with the World Bank and International Monetary Fund to phase out perverse subsidies for fossil fuels, and support carbon pricing so that the external costs of fossil fuels are properly accounted, and oppose expanded fossil fuel infrastructure. The World Economic Forum should seek to increase the visibility of The Alliance of CEO Climate Leaders and The Friends of Climate Action, and perhaps consider a Partnering Against Climate Change Initiative (PACCI) akin to the recently formed Partnering Against Corruption Initiative (PACI). And those of us in leadership positions - in manufacturing, finance, pension funds, education, and philanthropy - should help to steer our institutions away from investment in fossil fuels and towards investment in clean and healthy energy, as well as away from trade organizations that continue to oppose sensible climate and energy innovation policies. The business community has a historic opportunity to lead on climate change in 2017, and beyond. Where governments lag, the private sector can lead.